Ever since the failed RG3 experiment and subsequent mishandling of the Kirk Cousins situation, WTOP's Rob Woodfork says the Redskins look like a team more afraid of making the wrong move at QB than finding the right one. The perennially unimpressive Redskins made an unimpressive trade for an unimpressive quarterback. 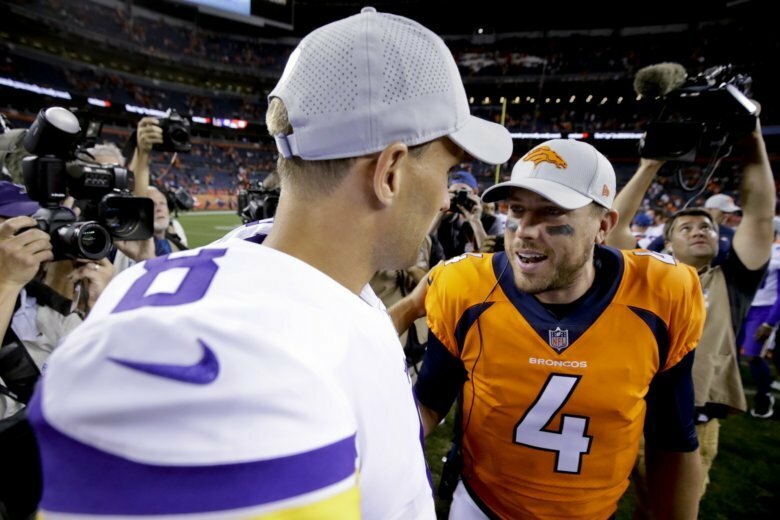 Nearly a year after the ill-fated trade with the Kansas City Chiefs for Alex Smith, the Redskins continued their AFC West dumpster dive for a QB by swapping late round picks with the Denver Broncos for journeyman QB Case Keenum Thursday. Denver was so desperate to get out from under their bad investment, they restructured Keenum’s contract so the ‘Skins would only be on the hook for $3.5 million in 2019, rather than the $18 million base salary his contract called for. This trade is a net victory for all parties involved, but let’s not mistake a desperation move for a good one. Keenum is comparable to Colt McCoy so the Redskins may be deeper at QB but not necessarily better. Keenum’s career 84.5 QB rating is marginally better than McCoy’s 78.9, but McCoy’s five years of experience in coach Jay Gruden’s offense likely closes that small gap. Furthermore, Josh Johnson played well enough at the end of last season to merit more consideration than a Keenum, who reverted back to a pumpkin last year after a career-best 2017 campaign. Though technically not yet available, Josh Rosen is a younger, possibly better and even cheaper option. Yes, Smith’s career-threatening leg injury made adding another veteran arm necessary, but it almost seems as if the Redskins are afraid to wade back into the rookie QB waters after the way the short-lived Robert Griffin III era turned out. Since taking RG3 and Kirk Cousins in 2012, the ‘Skins have selected only one QB (Nate Sudfeld, sixth round in 2016) that never took a regular season snap. Given the absence of a true franchise QB in Washington, the lack of at least a developmental one is borderline malfeasance. The Redskins gave a lot of attention to the top QB prospects at last weekend’s NFL Scouting Combine, so it’s possible they end the streak this year. Certainly, spending a first-round pick on a prospect like Kyler Murray would be preferred to the purgatory of starting Keenum for any duration. But the 15th overall pick might be just out of reach for a potential impact passer, and given the way things played out with their last mid-round insurance policy, can we really trust them to properly value that kind of find? Which calls to mind one very depressing reality for Redskins fans. For all intents and purposes, the Redskins surrendered promising young corner Kendall Fuller and moved back in the 2020 draft to replace their most productive passer in a generation with a guy whose name is synonymous with mediocrity. Around D.C., rehashing the whole Cousins fiasco is beyond beating a dead horse (at this point, it’s more like beating glue). But it bears pointing out they’re very likely about to start a fifth different QB since the beginning of 2018, none of whom were even within shouting distance of Cousins’ production and certainly not as durable as the man who’s started every game the last four seasons. The Keenum deal doesn’t preclude the Redskins from making another move, so the QB depth chart might yet add an exciting rookie and/or Rosen, whose $1.27 million post-trade cap number is very palatable. But at a time when passing numbers are at an all-time high, there’s no reason why the ‘Skins can’t get aggressive and find someone to join in on that fun, rather than continue collecting party-poopers. Besides…isn’t it about time the Redskins to do something bold to try and entice an apathetic fan base into giving a damn again?